The school competition in Wales is now open for registration! Last year 100 schools took part, with almost 3000 pupils of different ages and abilities producing anti-racism themed artwork. The Prize Giving Ceremony took place at the Marriott Hotel in Cardiff and all the winners from across Wales attended a formal lunch and award ceremony. Prizes included kindles, Wales Football tickets, Amazon vouchers, trophies, a SRtRC goody bag and a framed certificate. Guests were treated to some fantastic entertainment including balloon modelling, a circus workshop and some superb entertainment from Football Freestyler Ash Randall. The overall winner was Oliwia Dulisz from St Joseph’s Catholic and Anglican High School in Wrexham. 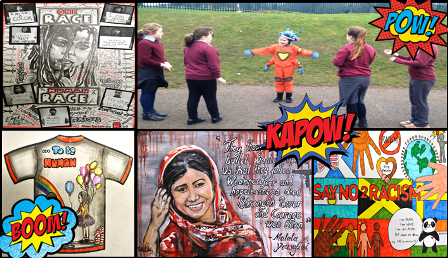 The judges felt Oliwia’s Malala Yousafzai painting deserved to be crowned overall winner as it displayed such artistic talent and it “completely blew them away”. The painting was exhibited at the Oriel Gallery in Wrexham for one week. With multiple categories for ages ranging from year 1 of Primary School through to year 11 in Secondary Schools, the Show Racism the Red Card competition in Wales is an accessible and engaging way to encourage pupils to think about issues surrounding racism. Entries will be divided into 10 categories including a special category. Prize winners will be invited to an awards ceremony and dinner at the Marriot hotel in Cardiff on the 27th April. Selected artwork will also feature in our 2017 calender. Don’t miss out on this fantastic opportunity and register your school NOW!